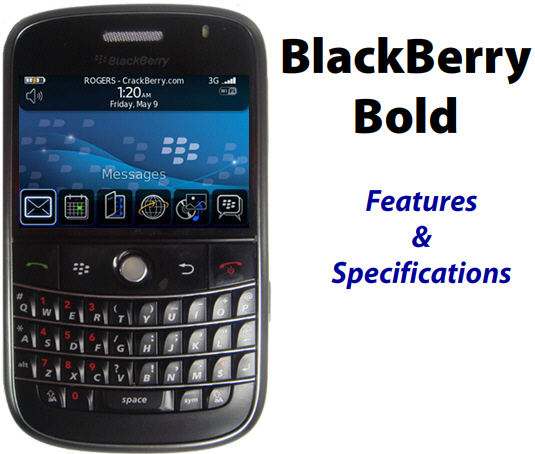 BlackBerry Bold - Features and Specifications! Media Player, Audio - BlackBerry Media Sync allows you to transfer your desktop iTunes music to your BlackBerry!!! All good stuff, but you can see in orange what has me excited here. When it comes to memory, the 9000 will be packing a Gig of built-in storage space for media files, etc. You won't be able to install applications on this (that's what the 128MB flash space is for), but it's still a welcome and much needed addition. It also seems all of us frustrated BlackBerry/iTunes users will no longer be frustrated!! And native DivX support? Sweet! I don't have final confirmation yet on whether the BlackBerry Bold will ship with a holster, skin (that's what was included with my eBay 9000) or pouch, but I'm guessing it could be carrier dependent. Either way I'm hoping a big selection of BlackBerry Bold 9000 Accessories will hit the market soon as I've never been a big fan of what ships standard. UPDATE: It looks like we were right about the BlackBerry Bold name. Going to www.BlackBerryBold.com now takes you to a page on the BlackBerry website!! That's it for now, I'm spent. Need to re-energize before flying out to Orlando to Attend WES. Talk to you guys from there!